Oh how I love a good Mariachi band! Here's a version with English subtitles. I have very mixed feelings about the The New York Philharmonic's state department visit to North Korea, but I'm certainly glad that they had the wisdom (and the opportunity) to take a music journalist who keeps a blog with them. I'm confident that Steve Smith will keep us all up to speed. Before I started playing the violin and writing music myself, I spent quite a bit of time obsessing about various composers. One of them was Augusta Holmès (1847-1903) who was born in Paris and grew up in Versailles. Her Irish father, Dalkieth Holmes, was a retired army captain, and her English mother, also named Augusta, was a painter, poet, and horsewoman. Her godfather, Alfred de Vigny, played a great role in Augusta Holmès' education (and some contend that due to a physical resemblance between him and Holmès that he was her natural father). Holmès studied harmony and counterpoint with Henri Lambert, the organist of the Versailles Cathedral, orchestration with Hyecinthe Klose (1808-1880), the Director of the Regimental Band at Versailles, and voice with Guillot de Sainbris. 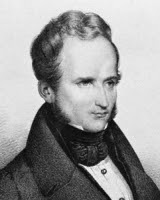 Later, around 1875, Holmès studied with Cesar Franck, who wove his romantic feelings about her into his Piano Quintet, a piece that Mrs. Franck despised. Musical life at Versailles was centered around a military band, and Holmès was surrounded by wind players. 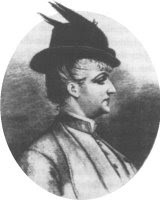 Her orchestration teacher Klose (who also taught clarinet at the Paris Conservatory) encouraged Augusta to both write for and conduct the regimental band. The advantage of her early training writing for winds gave Holmès' orchestration interesting textures and a fresh voice against the organ-dominated colors of her contemporaries in France. By age twelve, when she began writing songs, Augusta Holmès spoke French, English, German, and Italian. With a background in poetry and classics offered to her by her Godfather, she wrote most of her own texts. For some of her earliest songs Holmès used texts by contemporary poets, but for most of her 128 songs she supplied her own texts. She began having her songs published when she was fourteen, three under the pseudonym Hermann Zenta, and four under the name A.Z. Holmes, but the bulk of her music, most of which was published during her lifetime, was published under her own name. After her father's death and after serving as a nurse in the Franco-Prussian war, Augusta Holmès became a French citizen, and added an accent to the "e" in her name. As her father's only heir, she had a generous income and could live as she wished. She also had an extremely generous nature and supported her lover Catulle Mendès and their four children. 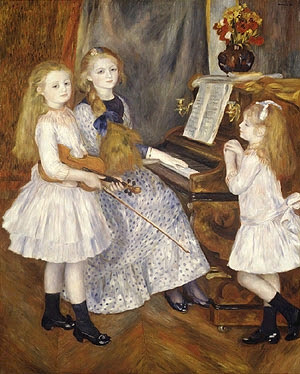 (Renoir's portrait "The children of Catulle Mendès" is a portrait of three of Holmès' five children). I find it odd that the on-line resources about Mendès do not mention Augusta Holmès. The family resemblance is rather striking. Those de Vigny genes seem to be rather strong. Not recorded, and probably very difficult to record (if the music is even available somewhere) is Holmes' 1889 Ode Triomphale, a piece for a chorus of 900 and an orchestra of 300--a virtual symphony of a thousand--that was performed four times during the Paris Exhibition. She offered her services gratis and donated the profits from the one performance that was not open to the public to the victims of flooding in Antwerp. The only complete biography of Holmès in English, The Life and Songs of Augusta Holmès, is a 1983 Ph.D. Thesis for the University of Maryland by Nancy Sarah Theeman. There is a 2002 biography about her in French, twelve of her songs were reprinted commercially in 1984 by Da Capo Press, and there is a book about her songs by Brigitte Olivier. 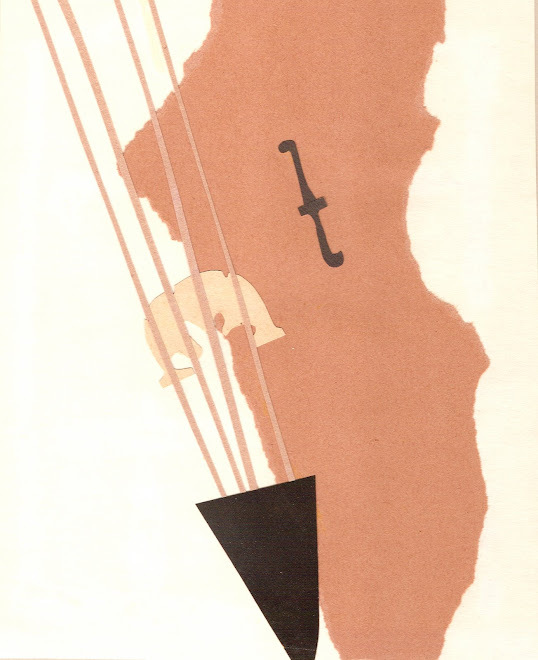 Though Holmès has largely been ignored by musicologists there is an article about Holmès in the 1967 Musical Quarterly (vol 53 #3). Rollo Myers judges Holmès' music by hearsay, and is quite critical of it without having an actual basis for his criticism. Thanks to the work done by Marco Polo, Da Capo, Nancy Theeman, and Brigitte Olivier, we should now be able to judge the music of Augusta Holmès on its own merits. Thanks to Martha for sending the link to this excellent game. This treat is from a German television broadcast aired in 1959. There's nothing like playing a freshly-tuned piano on a really snowy day. All this news about making ads attacking Barack Obama (without mentioning any names) with money raised by 527 Organizations prompted me to ponder the number. Here's a brilliant-yet-friendly take on that number that uses technological manipulation in its execution, and here is a very human and really terrifying one. Kind of makes you think. Deems Taylor wrote Of Men and Music in 1937, but somehow, aside from his constant use of the composer as "he," (who knew in 1937 that someone like me would take issue with such a reference? ), his idea that Bach represents the frontier of early music, and the names of the composers he thinks of as modern (because they were at the time), his ideas seem very current to me, so I thought I'd bring him back to life as a guest blogger. The idiom of art is constantly changing; only the things it says remain eternal. But the trouble is, that in the mind of one who is aesthetically inexperienced, idiom becomes confused with subject-matter. He sees only that the way in which Beethoven expresses himself is not the way in which Stravinsky, or Bela Bartok, or Alban Berg expresses himself; that if a present-day composer were to write a symphony that was developed, harmonized, and scored in the manner of Beethoven, he would hardly get a hearing. What he many not see is that the essential beethoven is utterly independend of Beethoven's medium of expression--a living man in an old-fashioned costume. The beginner in music, whether he be fourteen years old of forty, should approach it in the only safe way: that is, chronologically. If you begin whth Haydn, Mozart, and Donizetti and Bellini, you will never lose them. You may proceed safely through Verdi and Brahms and Wagner and Strauss and Debussy, straight on to whatever ultra-modernist represents the limits of your musical appetite, secure in the knowledge that the new will never spoil the old for you; that a mind nourished in infancy upon plain, simple food can assimilate richer fare later on, without risk of indigestion. This is, of course, in violent opposition to the opinions held by many moderns, who annouce that it is better to abolish the past entirely, and have dealings only with the present. It seems a meagre poverty-striken sort of regime to me. If music is a good thing, why not be able to enjoy as many kinds and styles of music as possible? Even a gourmet, it seems to me, must, if he would keep his health, be able to neglect his caviar long enough to take an occasional fling at roast beef. Music was written to be enjoyed, and we might as well enjoy as much of it as we can. The man who talks of Strauss as being old-fashioned, and Wagner as Victorian, and Beethoven as outmoded, and Bach as a primitive, may be getting himself a great reputation as a connoisseur; but he is certainly missing a lot of fun. Well, not really. Franz Mittler was a great "unknown" composer. He is not listed in Grove. He has works that have been published, but I don't believe the publishers who sold them are still viable (you can see a list of works that are housed in various libraries here). He lived in Vienna from 1893 (the year of his birth) until 1938 (the year of the Anschluss), and then he returned to Europe in 1964 where he remained until his death in 1970. His daughter wrote a book about him that was published in 1994 but does not seem to be available anymore (It was her doctoral dissertation). CPO has just released a CD of two of his wonderful string quartets that you can sample at Amazon (he wrote the first one when he was 16). My hope is that this becomes a kind of "gateway disc," and more recordings of Mittler's music will become available. I came across a clever little poem of his that brightened my day yesterday. Maybe it will brighten your day today. I'd like to leave the state, why should I bother? Let the remaining contrasts fight each other. Must I stay sandwiched in between forever? This letter from Mittler holds the key to the deeper meaning of this poem. 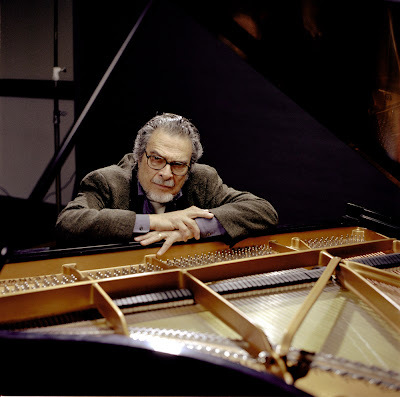 Leon Fleisher wrote this excellent column in yesterday's Washington Post that is well worth sharing. One summer day in the very early 1980s I went with a friend to a place called "Hatch Lake" in upstate New York. We stayed with an old friend of his family who was a violinist--or had been a violinist. I remember staying up very late talking with this wonderful man about violin playing, about Vienna (where I had lived for a while), about practicing, music, and the violin repertoire was one of the first beams of light that illuminated my inner violinist's soul (I was a flutist at the time) and led me on what I consider my path to true musical happiness. I have been trying to remember the name of this wonderful man for years. I would do periodic Google searches for "Hatch Lake" and "violinist," hoping in vain that I would find something. 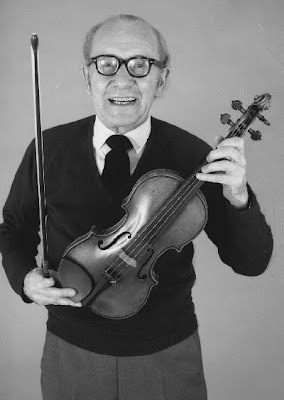 Yesterday, while reading Anne Mischakoff-Heiles' excellent new book America's Concertmasters, a must-read for anyone interested in the violin, orchestras, and orchestral music, I came across this picture of Felix Eyle (c. 1899-1988). After admiring it for a while, and after reading a story he told about a horse, I realized that he was the man I had been looking for. If I only knew then what I know now, the questions I could have asked him! I could have asked about studying with Arnold Rose. I could have asked him about Mahler. I could have asked to see his instrument (the one pictured here), a Guadagnini violin that belonged to Arnold Rose's daughter Alma. I could even have asked about his years as concertmaster of the Metropolitan Opera Orchestra. I was such an innocent young person, and he was so kind to me. If he were alive today I could tell him that talking with him that night was one of the experiences that inspired me to play the violin. Maybe he knew. I spent a good deal of my youth thinking that there was a true connection between goodness and good music, and I have spent a good deal of my adult life finding that there is really no connection at all. Granted, there are and there have been great performers and composers who have been highly moral people, and there have been lousy composers and lousy performers who have been highly immoral people. I have played great performances with people who I would disagree with wholeheartedly on a number of issues, both personal and political, and I have played disconnected performances with people who I admire a great deal as thinking, feeling human beings. The best-known case of a great composer who was a horrible person is Wagner. As much as I despise what I know of him as a human being, I am a sucker for his music. Wagner shared his vocal opinon of Jews, particularly Jews who were composers, with Vincent D'indy. D'indy's music isn't played all that often, and I imagine that the majority of 21st-century music lovers who know his work at all only know his Symphony on a French Mountain Air, so it would be easy to dismiss him as a kind of "one hit wonder." He was as antisemitic as Wagner. He even wrote a blatantly antisemitic opera, and claimed that Jews were not capable of creativity. He was also rather fascist in his thinking, but I have read that he was not completely out of step with his early late 19th-century French anti-Dreyfus contemporaries, many of whom were not accomplished composers. I would love to hate D'indy's music, but I can't. His instrumental music (I haven't heard the opera) is stunning. His orchestration is brilliant. His ideas are fresh. He writes beautifully for winds, strings, and brass, and piano, and he often uses really interesting combinations of instruments in his chamber music. I am too old to recognize most of the people in this video, but I am certainly not too old to appreciate its message and its brilliance. And here's another video by Joe and John Bergevin that has been around for a few days. What a campaign this is! "While music exists in time, inspiration is usually just a lightning flash, and a flash of lightning does not a concert make. Music has to occupy the time slot needed to express the idea. In a way, a composer is stretching out a ball of chewing gum into a long string of gum. It is a technical and, in the literal sense, an artificial process because the composer must use both artifice and skill. The "stretching" is the real hard slog of my composing. As for getting the idea in the first place--well, nobody really knows where ideas come from. I can have bad days when nothing usable comes and good says when quite a bit of material may come my way. After that brief inspiration, the rest is all manipulation and technique. However, during the process of manipulation musical ideas, new ideas, do seem to come along. Stravinsky may have put it best; when asked, 'When do your ideas come to you?' he replied, 'When I am working.' I think that sums it up." Scott Spiegelberg found this wonderful clip that is sure to make you smile.